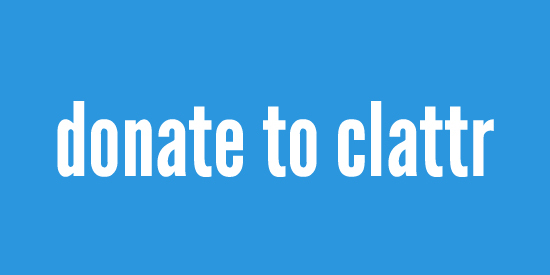 Thank you for considering pledging your support for Clattr. Without the help of cool people like you, we know this crazy idea wouldn’t even be a possibility. Our goal is to create a community to stay updated on what’s happening in the world. Ideally a place to share news, stories, ideas and more, without being restrained by past generations. If you’d like to donate you can do so via Patreon which is a safe, discreet and anonymous way to do so by clicking below to visit our donation page. Best of all you can donate as little as a $1.00 and know that it goes directly to funding the growth our movement. Your name, donation amount and personal info will always remain confidential. Your donation turns into something beautiful! Not only does it fund the ongoing success of our website but it also allows us to grow across all social media outlets ranging from facebook to twitter and all those in between. We take the input from our supporters very seriously and want all of you to become part of turning this community into something for us. Your ideas will always be taken into consideration and often implemented. Come join the movement and thank you for helping to make it happen.